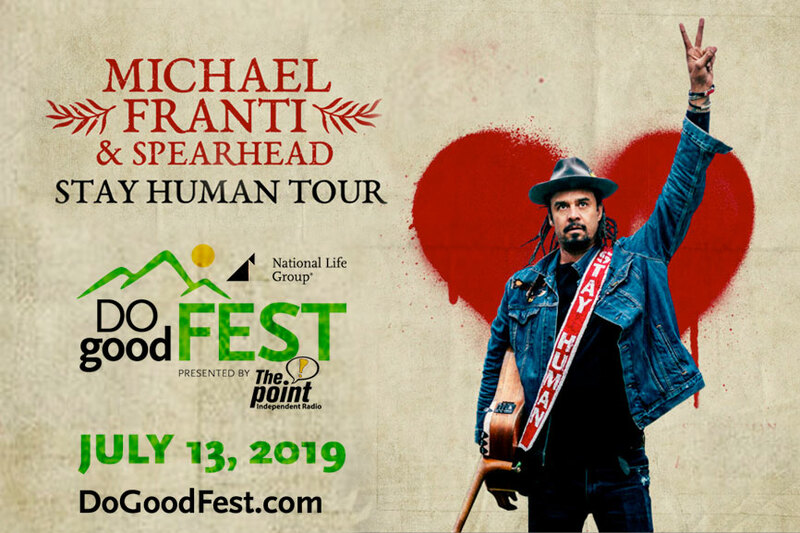 Michael Franti & Spearhead will be rocking the hillside at Do Good Fest 2019 in July 13. The iconic rocker and fan favorite will headline the sixth annual benefit music festival on the lawn at National Life in Montpelier, Vt.
He’ll be supported by opening act Hailey Knox, a rising young star who commands the stage solo with her heartfelt songwriting and performing. Admission to the afternoon and evening of music and community celebration is free and the proceeds of all parking and merchandise sales benefit Branches of Hope cancer patient fund at Central Vermont Medical Center. Over the first five years of the festival, more than $135,000 has been raised for Branches of Hope. Do Good Fest Presented by The Point is also a showcase for other charitable organizations in the region, who share some of their good work in the Nonprofit Village. Two beer gardens and a variety of food trucks will be on the festival grounds, along with a children’s area. The night will close with a signature fireworks show. The day kicks off with the music of SoundBrother, which formerly performed as The DuPont Brothers. The band just released a new single this month. Erin “Syd” Sidney, who performs as Syd, rounds out the lineup. All of this year’s bands already have or will soon be releasing new music Franti is currently touring in support of his new “Stay Human” album. Advance parking passes will go on sale later in May, along with Do Good Packages of limited edition merchandise.